Here’s a status update from this historic trial, including a rundown of elements being investigated in addition to stroke survivors’ functional outcomes. The first patient to ever undergo deep brain stimulation (DBS) to enhance motor rehabilitation following hemiparesis after ischemic stroke has experienced significant and steady functional improvements throughout the first five months of management pairing DBS with rehabilitative therapy. The 59-year-old woman had a DBS electrode surgically implanted in her cerebellum in December 2016 as the first participant in a first-in-human clinical trial of DBS for stroke rehabilitation, which is being conducted at Cleveland Clinic. This article briefly reviews the patient’s progress and our study’s rationale, design details and current status. Our trial is examining a novel strategy — stimulation of the dentatothalamocortical pathway to enhance excitability and plasticity across spared cerebral cortical regions — with the aim of promoting recovery of motor function following stroke. The primary hypothesis is that by applying DBS to the connections between the cerebellum and cerebral cortex, we can facilitate the plasticity that occurs in the surviving cortical regions around the stroke and thereby promote recovery of function beyond what rehabilitative therapy alone can accomplish. For this initial trial, we plan to enroll 12 patients who, despite traditional rehabilitative therapy, have persistent, severe residual hemiparesis from an ischemic stroke 12 to 36 months earlier. In addition to the patient reported here, a second patient has undergone DBS electrode implantation but hasn’t completed enough subsequent therapy for results to be reported. The study is being conducted solely at Cleveland Clinic with funding support from the National Institutes of Health’s BRAIN initiative. Within a few weeks of when the DBS device was turned on, the trial’s first patient reported she could move her affected arm in ways she hadn’t been able to since her stroke (Figure 1). Her function has steadily and progressively improved ever since, as measured by the upper extremity subscale of the Fugl-Meyer Assessment of Motor Recovery after Stroke. She reports that she is now able to use her affected arm to cook, play games with her grandchildren, fold laundry and perform many other routine tasks. Her functional progress had not yet plateaued as of this writing, approximately five months after stimulation was started. Figure 1. The trial’s first patient uses her affected arm in a therapy session four months after the start of stimulation. The initial trial protocol called for a slow weaning from stimulation over the course of a month after completion of four months of concurrent DBS and physical therapy. However, continued progress by the first patient across even the fourth month of stimulation prompted us to obtain FDA approval to revise the protocol and extend therapy. Concurrent DBS and physical therapy will now continue for several additional months to afford the patient the opportunity for additional improvement, with stimulation weaned after nine months of treatment or when the patient’s motor improvement appears to have plateaued (whichever comes first). 7T magnetic resonance imaging (MRI). Each trial participant undergoes 7T MRI prior to surgery to allow optimal visualization of target brain structures. Our team’s engineers use these images to develop patient-specific models of the pathways that we are attempting to modulate in order to achieve the therapeutic goal. These 7T images and the resulting models will help create a guidebook to elucidate the relevant anatomy for neuromodulation for stroke rehabilitation moving forward. While postoperative 7T MRI evaluation would be valuable as well, the DBS device used is currently incompatible with MRI. Serial positron emission tomography (PET). All patients undergo a series of four FDG-PET imaging studies — at enrollment, after DBS electrode implantation, during DBS treatment and a month after stimulation is turned off. These studies will test our hypothesis that metabolic activity along the brain pathway being targeted with DBS will increase in conjunction with any observed therapeutic improvements. Below is a baseline FDG-PET image from the trial’s first patient showing a right hemisphere stroke (Figure 2). Figure 2. Baseline FDG-PET image from the trial’s first patient showing a right hemisphere stroke, as indicated by the reduced FDG uptake across that hemisphere (red signifies highest uptake, blue signifies lowest). Intraoperative somatosensory evoked potential (SSEP) and electroencephalographic (EEG) testing. We are supplementing our initial 7T imaging guidance with intraoperative SSEP and EEG recordings at the time of DBS lead placement. These techniques may allow us to determine which electrical contacts along the octopolar lead are showing greater representation of motor-related neural activity and to assess changes in activity in response to acute stimulation in different areas. Given that neuromodulation for stroke rehabilitation — in contrast to movement disorders — does not allow immediate motor feedback once stimulation is started, this type of intraoperative testing can be invaluable in helping to determine which contacts to use for chronic therapy. Transcranial magnetic stimulation (TMS) to assess cortical changes. Our team is using TMS as part of the acute programming sessions to assess whether DBS is enhancing excitability across the areas of cortex where we hope to achieve functional change. Additionally, TMS is being used to map the representation of motor activity for different regions of the body across those same spared cortical regions in order to identify whether any functional reorganization of the cortex is being achieved in response to therapy. An additional goal is to initiate the development of paired associative stimulation paradigms that use the electrophysiological information that we record from the dentate nucleus to provide stimulation in a timing-dependent manner. The result would be a “smarter” closed-loop system that actively reinforces a patient’s attempted movements instead of relying on constant reinforcement. Clearly, many questions remain, but we are encouraged by the positive results so far in our trial’s initial patient. We look forward to learning much more as this study continues. Dr. Machado is a neurosurgeon and Chairman of Cleveland Clinic’s Neurological Institute. 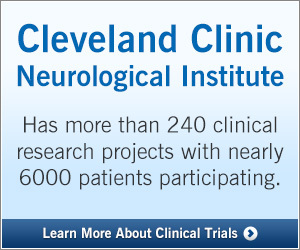 Dr. Baker is a neuroscientist in the Department of Neurosciences in Cleveland Clinic’s Lerner Research Institute.